"Group photo in front of the villa at a hot springs"
Group photo in front of the villa rented by Bp. 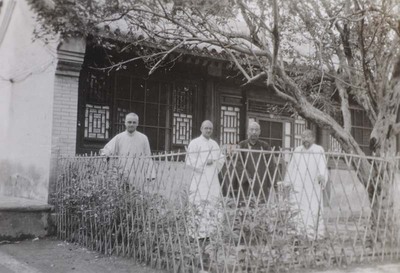 Pierre Tch’eng (Cheng) of Xuanhua in hot springs (wen tsu’an 溫泉)in Beijing Fragrant Hills. From left to right: Fr. Paul Gilson; Raymond de Jaegher; Bp. Pierre Cheng 程有猷 of Xuanhua; Fr. Jean-Baptiste Fan樊 pastor of Anguo. Group photo in front of the villa at a hot springs. August 1933. Société des Auxiliaires des Missions (SAM) China Photograph Collection, Whitworth University Library, Spokane.